(from left) sloes, rowans, elderberries, orange rowans and hawthorns. The berries are here. Ever since the first week in August, the rowans have been blazing away with bouquets of red berries, followed shortly after by fuzzy red strings of hawthorn on every hedge. I have been gathering berries here and there for the past few weeks, and although most of the rowans have now been gobbled down by blackbirds (and hopefully black grouse), other species are ripening and readying themselves every day. I ultimately hope to grow trees with them in the spring, but the first step has been to extract the seeds and dry them off. As I drove into Dumfries today, aching elderberry heads loomed in from the hedgerow beside the road, and I gathered in a handful without causing too much mayhem in the gradual flow of traffic. They were very fragile little things, bursting with sweet juice and containing three tiny pips apiece. Hawthorns are not hard to find, and three hundred yards further down the road, I stopped again to snap a dozen or so more red berries from a groaning branch which lay out over the verge. I have been collecting odd hawthorns here and there from across the county so that they will have some good genetic diversity when the time comes for them to pollinate one another. Rowans too were easy to come by, and I have around twenty tiny little chocolate brown seeds to sow in the spring, along with those from a few orange berries which were found in the carpark of Currys in Dumfries last month. Sloes were found growing in huge numbers by the side of the road as I was coming home today, and it didn’t take long to gather thirty purple spheres from amongst the long spiky twigs. The stones inside were huge, the flesh being only a small percentage of the overall volume, and now all of the above are drying out on a radiator before they are stashed in an airtight container over the winter. With the moor dying away, it’s easy to get gloomy about the long months ahead, but the last few weeks have seen a great rise in the numbers of caterpillars across the lower ground on the farm. Two of the most recent finds have been ruby tiger (on bog cotton) and light knotgrass (on soft rush). Neither of these attractive little blighters do much damage to the farm, and they have been included in this blog only because I find them quite interesting. And besides, it’s nice to know that life goes on despite the fact that the weather is seriously starting to cool down. The time is fast approaching when these ferrets of mine will start to pull their weight. I would say that they are eating me out of house and home, but the fact is that while they do put away tremendous quantities of meat, it is all leftover scraps and game, neither of which I would describe as being my “house” or “home”. With a view to introducing them to the exciting world of bolting rabbits, I took them over to a friend’s farm this afternoon. A warren was selected far out from the hedges in a silage field below sea level where the soil was very sandy. If anything went wrong, I reasoned that the loose soil would be easy to dig through. One ferret was tried, then the other, both with leads and harnesses on a limit of six feet. After half an hour of enthusiastic but ultimately pointless messing around, I headed up to the nearby farm buildings where a huge amount of rabbits were grazing on the short grass. Still one hundred yards out, I watched a small rabbit hop into a disused 12″ diameter pressure hose from the silage pit. Knowing that the hose was blocked at its far end, I inserted a ferret. I know that they need to be big and strong before they can deal with rabbits, but they have grown so much over the past eight weeks that I fancied their chances of bolting it out again. It was not to be. Within seconds of putting the big ferret in, there was a tremendous scuffling and thumping, followed by a short sequence of squeaks. Less than a minute later, the ferret came back with fluff under his claws and blood on his face. 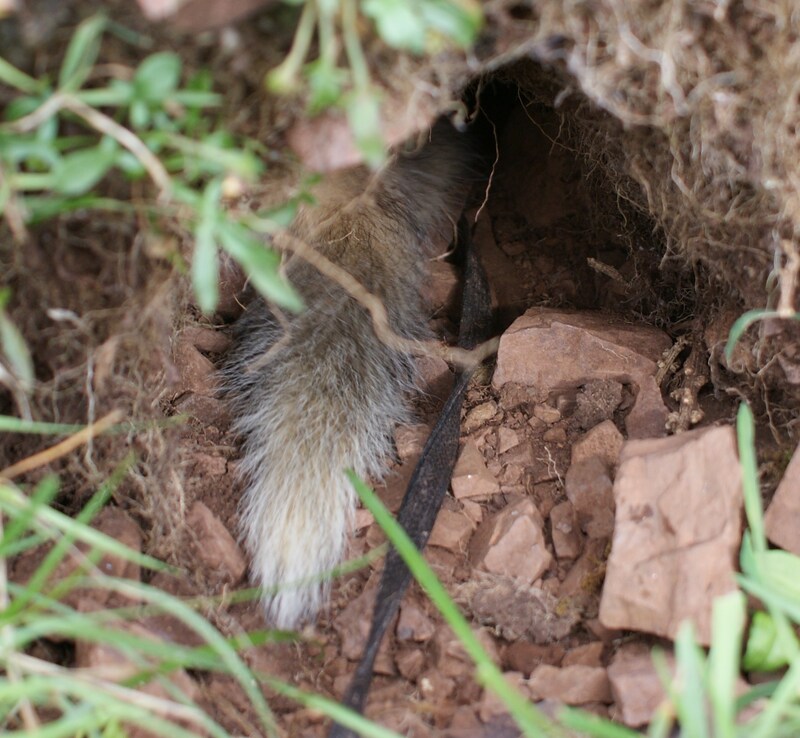 The rabbit was stone dead, and it took longer to remove it from the pipe than it had done for the ferret to dispatch it in the first place. On closer insection, it was fairly sick and mixy, but still strong enough to defend itself, as I had heard through the walls of the pipe. When shown the body, the other ferret happily mauled it for ten minutes. What a ferocious pair they have become… Mixy rabbit it may have been, but I hope that this is the way of things to come! Summer is formally over. Until we receive further instructions from autumn, we are in a difficult middle ground. The chestnuts around the farm are turning and the bracken is almost all gone. Out in the fields above the far shed, chaos reigns. The few pasture fields on the Chayne have become infested with thistles over the summer, and now a raised canopy of downy thistle heads stands eighteen inches above the short nibbled grass. Walking over the ground yesterday with Chris Land, a fellow black grouse enthusiast from the Scottish Borders, I heard a very familiar trilling sound. 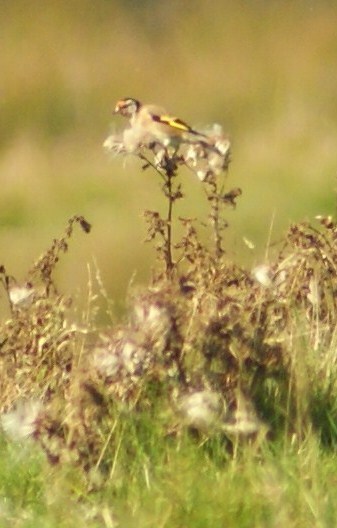 Looking through my camera’s long lens, I saw that that the field was alive with goldfinches. The collective noun for goldfinches is a “charm”, but there was nothing cute and bonnie about these birds. They clattered through the thistle heads, squeaking and fluttering in a state of chaotic confusion. As we walked through them, they flickered away to another area of the field, peeping with frustration. In amongst them, squadrons of linnets and pipits swept out to rest on the dyke below us, and the overall impression was one of earnest but childish industry. Remembering how barren and grim the Chayne was throughout last winter, I suppose I had better enjoy having these birds on the land while I still can. Having a camera at all times is great, but you sometimes wish you had a gun instead. One of the first rules of wildlife photography is that you should always have a camera on you at all times. I am not a wildlife photographer by any stretch of the imagination, but by virtue of having a long lensed camera over my shoulder all day and every day, I have got lucky once or twice. Walking off the hill this evening, I dropped into a wide ditch which winds through the bog so that I could get out of the nippy wind. It picked up in the mid afternoon, blowing the grass into a shiny horizontal mat. By the time that I decided to come in, it was unpleasantly strong. Despite the chill factor, it was a lovely clear bright evening, and I heard a party of greylag geese get up from the loch at Glengorse and swing up towards me. In a few seconds, they had come a great deal closer. Poking my head out of the ditch, nineteen geese swept in out of the setting sun at a height of less than thirty feet. The wind was keeping them low and I took three snaps before they had gone. The word “snap” upsets photographers because it implies the use of a cardboard camera, but I’ll defend it in this instance because I hardly had time to swing the lens up for a split second before they were gone again, whisked away over the cairns to the next valley. Having shot them with the camera, all that remains is to shoot them with a gun… If they had any sort of routine I would know how to tackle them, but the chances are that I have missed what was probably my only opportunity to shoot geese on a grouse moor. This first year of my project to preserve and create black grouse habitat has almost come to a close (although this blog is much younger), and as the moor starts to shrink back into inscrutible silence again, I notice that one of my most important plants of 2010 is dying away as well. I first realised that we had blaeberry on New Year’s day, when I fell into a ditch and smacked my face off a large bank of the naked green strands. 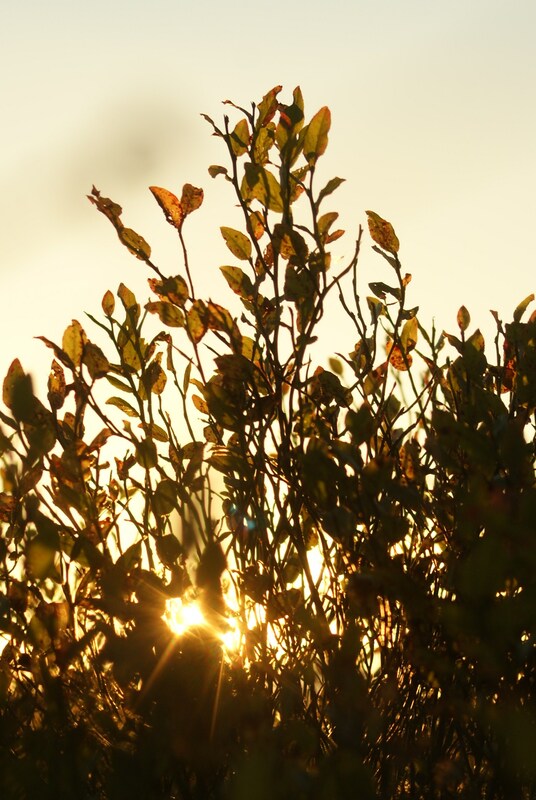 Since then, I have come to know and love the determined little plant, gobbling down its berries in July and cutting back trees to allow it more sunlight through February and March. Blaeberry really is so important to black grouse and many other moorland birds, and although it is in serious decline across the majority of the farm, the small areas where it thrives are doing fantastically well. The little leaves may be falling down to the moss, but the plan is that when they return again next spring, things will look even brighter than usual. I have a busy winter ahead, clearing trees and protecting the vulnerable shoots from livestock, but if all goes according well, blaeberry should soon enjoy a pleasant turnaround in fortunes. The woodcock strip has come alive with sinister toadstools. Bit by bit over the past few weeks, red balls have emerged from the undergrowth, thrusting aside fallen sitka needles and dead grass. At first, I took them to be fly agaric, the classic red and white spotted toadstool that everyone knows is deadly. However, as the caps fanned open and no white spots emerged, I began to have doubts. With dazzling white stalks and undersides, slugs set about chewing away sections of the red upper coating to reveal a soft and misleadingly inviting white interiors. It was only when I posted a sample photograph on iSpot that I had a formal identification. Many poisonous toadstools have threatening names like “death cap” and “destroying angel”, and what I had found was no different. Russula emetica is popularly known as “the sickener”, belonging to a fairly toxic family of fungi with a widespread distribution across much of the northern hemisphere. People who eat raw “sickeners” quickly suffer from intense stomach cramps, diarrhoea and vomiting. 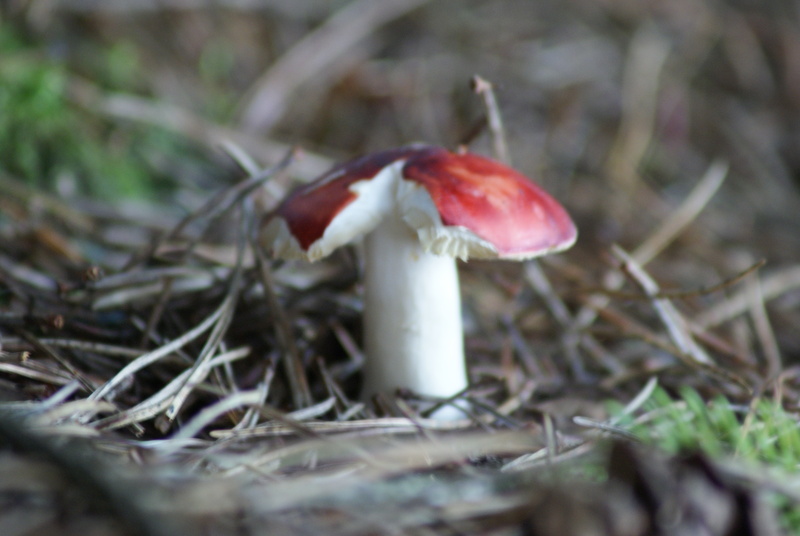 Other similar species of fungus from the russula group are edible, but they differ so slightly in appearance that it is a risky business gathering and eating them with any confidence. Apparently, red squirrels have been found to gather “sickeners” to store and eat them at a later date when the toxins have declined and the toadstools are safer, making those little red devils unexpectedly wise and forward thinking. I was beginning to think that they are rather foolish, given that I have seen half a dozen squashed on the roads over the past few weeks.